Whilst we can probably all recall a time when we have felt stressed, it can often be difficult to identify exactly what stress is or to know exactly what it means. MIND the mental health charity says . • Situations or events that put pressure on us – for example, times where we have lots to do and think about, or don’t have much control over what happens. Feeling stress is completely normal, it’s a way of protecting you from threats and preparing you for action that dates back to hunter gatherers times. The fight, flight or freeze hormones called cortisol, adrenaline and norepinephrine are released under stress and help you to cope more effectively in pressure situations and better choose the right response. 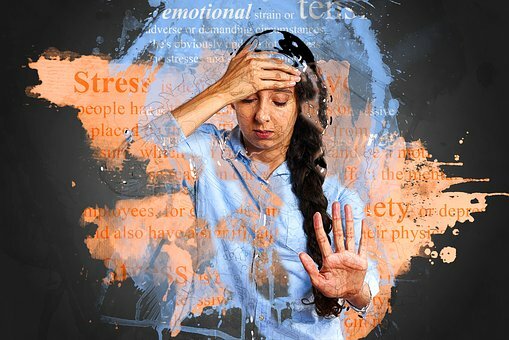 Feeling a degree of stress or pressure in everyday life is normally positive as these hormones enable heightened awareness and response and can energise and motivate you to get on and achieve more and better levels of performance, or they can encourage you to keep going and push through a difficult situation to the end. Once the stressful situation has passed feelings will usually “return to normal” and the stressful feelings disappear. Long term exposure to situations or events that are stressful can mean you are producing high levels of these fight or flight hormones consistently and this could lead you to experience a permanent state of fight or flight and ultimately to feeling overwhelm. If we don’t look after our mental well-being then poor mental health can be the result leading to mental illness such as anxiety, depression and eating disorders or physical illnesses such as stomach ulcers, high blood pressure and heart attacks. From a work perspective it can also lead to low morale, poor time keeping, low productivity, poor safety standards and absence from work, possibly then accompanied with some form of physical reaction such as upset stomachs, headaches or tiredness. These are usually some of the first signs that something is wrong. What triggers stress in someone and how we cope with it is different for everyone. Many things can lead to feelings of stress and there is no one catch all way of saying “I have stress and this is what it looks like and feels like”. • Physical responses like, tiredness, upset stomachs and headaches. And stress also tends to manifests itself in the weakest parts of our bodies or behaviours, so if you’re prone to headaches you might find you get more headaches or maybe migraines. If you have skin conditions such as Eczema you might get flare ups, if you have low patience thresholds you may find you are even more impatient and irritable and so on. We all have bad days too so one day of feeling grumpy and irritable doesn’t mean that you necessarily have stress. Noticing and identifying prolonged periods of unusual or negative behaviour or physical symptoms are more of a clue. Avoiding problems rather than facing into them can make things worse so, as hard as it may be, it’s important to tackle the causes of stress in your life if you can. Being aware of what your stress triggers are and your typical responses can be helpful in finding solutions and ways to move forward. Can you pin point the occasions, times, or situations in which you are likely to feel stressed? Can you recognise your symptoms? Do you know what strategies help you or make you feel worse? Try keeping a diary of events or situations where you felt stressed and write down what happened and how you felt. Maybe even give the feeling an intensity rating on a scale of 1-10. Journaling can be therapeutic in itself, whilst jotting down when you notice symptoms and reactions or noting key points on a calendar can help you recognise patterns that may be forming, help you to find solutions and take back control. Sleeping too much or not enough is common when experiencing stress. Try to reduce the amount of caffeine or alcohol you consume overall and particularly before bedtime (alcohol and caffeine can increase feelings of anxiety and restlessness) make sure your bedroom is a relaxing place to be, take a warm bath or read a book before bedtime to help you relax and try to establish a set bedtime each night Writing down your to do list for the next day can be useful in helping you put aside the plans for tomorrow before sleep. Food can also affect our mood. So, make sure you are drinking enough water and eating a balanced diet avoiding refined sugars where possible as these can cause energy crashes which can lead to feelings of irritability and tiredness. Practising breathing techniques. We tend to breathe more quickly, higher in our chests and shallower when we are stressed. By breathing in through the nose and out through the mouth, slowing our breathing down and taking deeper, slower “belly” breathes we can create a feeling of calmness. Mindfulness and meditation can be practiced anywhere at any time. There are many different ways of doing this from Yoga, to sitting quietly somewhere focussing on a meaningful word to meditation techniques and meditation apps. Research ways that you find appealing and give it a go. And do things for you instead of trying to please others all the time.do what makes you happy, laugh have fun. Even a little bit of physical activity every day can make a difference to how you feel and provide a natural ‘mood boost’ through the production of endorphins. Join a gym or simply go outdoors and feel the sunshine on your face and the wind in your hair. Walk, jog, run, cycle, swim. There are many different ways of getting active. (Make sure its within your physical capabilities and if you haven’t exercised for a while, you may want to get checked out by a doctor first) why not take a friend along and make it a social event? It’s all too easy to focus on the negatives and what isn’t going right but there is always a different perspective. Try looking for the positives in a situation or in your day or week and keep a balanced perspective. Appreciate what you have and say thank you. Write down 3 things you are thankful or grateful for each day. Practising gratitude and recognising the positives in your life can be a great way to bring back balance and perspective. See our gratitude blog for more ideas on how to do this. Try avoid too much screen time before bed. TV, Phone, Tablets, etc, can all overstimulate the brain. Can you plan the times you check your emails or social media accounts and leave yourself time to relax? Are you personally taking on too much? Are there things you are doing which could be handed over to someone else? Can you do things in a more slowly? Its easy to isolate yourself when you are stressed or to avoid talking about what’s going on so confiding in close friends, family or a work colleague can really help with advice and support and to give a different perspective, find solutions and help relieve the tension that builds up when you keep things to yourself. There are also many professional bodies that are trained to help you to find solutions to dealing with your stress. Joining a club, doing community work or volunteering are also great ways to beat the isolation, feel part of something bigger and help you recognise that other people have problems too. All the tips listed here will help build your resilience and remember. We’re not perfect, we all make mistakes and its ok to do so. Try cutting yourself some slack and keep things in perspective and don’t be too hard on yourself. If you continue to feel overwhelmed by stress, seeking professional help can support. The first person to approach is your family doctor. He or she should be able to advise about treatment and may refer you to another local professional.